Take a pin, dip in alcohol and flame sterilized the pin. This sterilize pin is used to take a tarter sample present in inter-spaces of teeth. Now this tarter sample is mixed in the sterile distilled water. A drop of this suspension is taken with the help of a sterile wire loop on a clean grease free slide and smear is prepared. This smear is air dried but not heat fixed. This smear is fixed by using a chemical fixative that is Fontana’s fixative. The slide is placed on a colphin jar containing Fontana’s fixative for 3 times at the interval of 1 minute. Further, the fixative is washed off and the slide is treated with 95% alcohol for 3 minutes. After 3 minutes the excess alcohol is washed off and the slide is held with the help of forcep and passed through a flame to remove excess alcohol. In the next step, Fontana’s mordant is added on smear and heated till steam appears. After steam appears the slide is washed with water, air dried. This air-dried slide is now treated with Fontana’s stain and heated till steam rises. After steam rise the slide is washed with distil-water, air dried and observed under oil immersion. 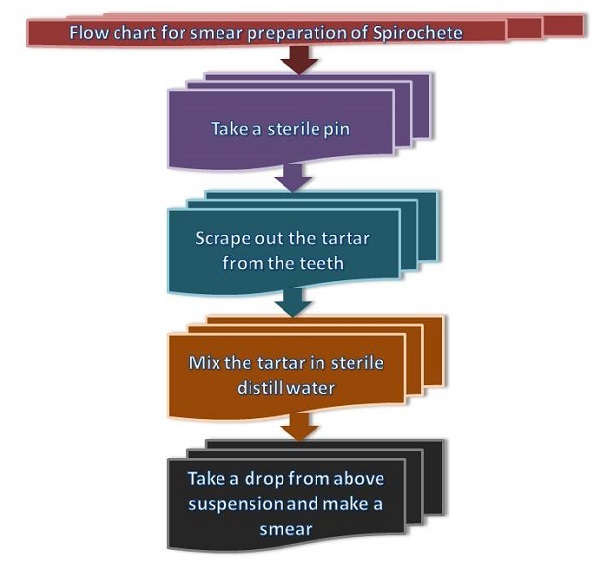 Flow Chart of smear preparation for Fontana’s staining procedure. 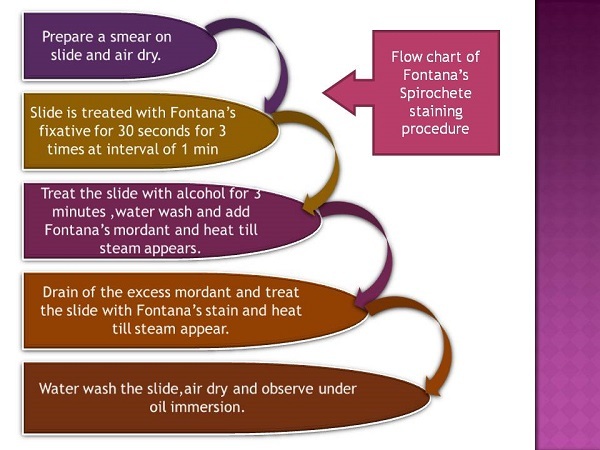 Flowchart of smear preparation of Fontana’s staining technique. Flowchart for Fontana’s staining procedure. The spirochete is very delicate organism they easily get destroyed by heat fixation so here heat fixation step is avoided. Here smear is treated by Fontana’s fixative.T his fixative contain chemicals like formalin and glacial acetic acid. After fixation, the smear is treated to Fontana’s mordant. This mordant contains tannic acid which increases the affinity of the stain towards stain. Further, the stain is treated with alcohol and Fontana’s stain. Fontana’s stain contains ammonical silver nitrate and when this stain is heated it forms silver oxide is formed. This silver oxide precipitates on the organism and increases the diameter of the cell and stains the cell. After completion of Fontana’s staining procedure, the Spirochete are stain brownish black in colour. Thanks for Providing the information in simple for , which is necessary for Rural Students to understand. Thanks once again…..!